We had planned a couple of quieter days, but I wouldn't exactly say that they turned out that way since Jenn suddenly got sick. She spiked a high fever and chills Friday just after lunch. The symptoms were bad enough and close enough to dengue that we went to the Singapore hospital. The Doctor said it's probably just a viral infection, prescribed some medications, and were were out of there in an hour, having paid just $90 (SD). Great system, very modern. Jenn's fever is gone now, as of Sunday, but she still isn't back to eating everything. We had also enjoyed lunch that day in Lau Pa Sat (the "old" market). It's a hawker centre in a huge, filagree-iron, open-air building. Built in the 19th century, it's essentially the old, Victorian-England railway station style. There are probably 200 hawker stalls to choose from (in Canada, at a mall, we would say this is a "food court"). An older woman came to our table, smiling. "Finland?" she said. "No, Canada," we replied. "Oh, my daughter, she marry a Finland." Then, a minute later, she returned, with tears in here eyes and told Anica, "you make me very, very happy coming here today. You look like my granddaughter." Jenn and I nearly cried then, too. Jenn, despite being sick after lunch on Friday, wanted to move on to Melaka, esp. since we couldn't get our room for another night. We already had our bus ticket and hostel booked. Luckily, the bus was clean and A/C, and there were a couple of chances to get to the washroom when it stopped. When we arrived in Melaka, the taxi-drivers were asking a lot more than we expected, so we opted for the town bus. We had met two Estonian girls, also heading for "The Traveller's Lodge." After getting off at the right stop, all five of us went in every possible wrong direction together before finding the hostel. Luckily, it's a very nice place. We have a big room, good A/C and a bigger bathroom than in Singapore. The whole place is incredibly clean; it's like an oasis. One quirk: no shoes allowed inside - anywhere. The Muslim hostel managers said, "It is our culture, and the easiest way to keep clean." My mom would be horrifed, but here it seems right. Today we went to Sentosa Island. It was fun. 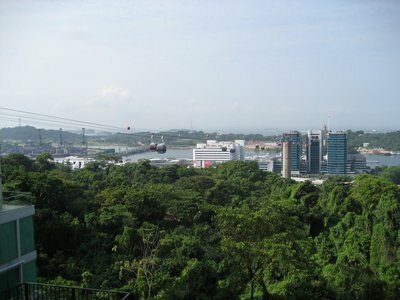 First we went on the MRT [n.b.-this is Singapore's subway system], then rode cable cars and got to Sentosa. Time 10:00 AM. Went to Dolphin Lagoon and saw two pink dolphins. Princees. 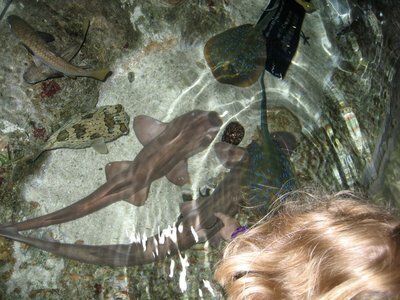 [princesses] Went to underwater world, petted baby sharks and fish, pufferfish and fed manta rays. 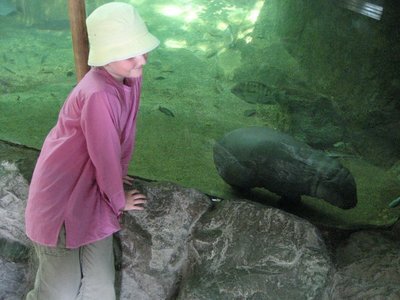 Anica petting the bamboo shark and manta rays. 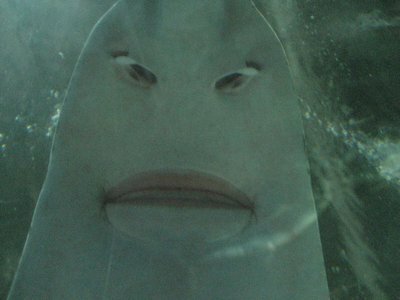 saw fish and jellyfish and quet [cute] seaangels, went through the underwater cave and saw sharks, fish, manta rays and sti[ng]rays, and even one mantte [dudong or manatee] nammed Gracie. We took this photo in the underwater tunnel. This sawtooth shark was resting on the roof. We saw 3 white tigers, somthing nickenamed catbear and then went for Night Safari. GOOD NIGHT!!! Yes, the Night Safari was a very good night. It's right next to the regular zoo. Both are gorgeous, lush, rainforest settings, with decor/designs like world-class theme parks. Many animals are free-ranging, so encounters are often delightfully startling. 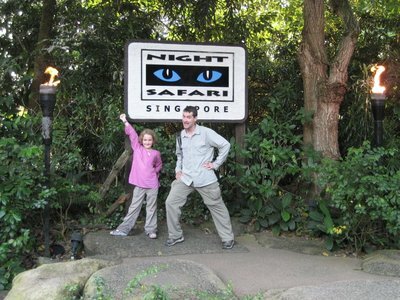 After dinner at the Night Safari enrance, we saw a rousing, cheesy, fire-eating show just as it got dark. Anica loved the antics of this Borneo troupe. Then we got on the tram. Everyone was hushed as it cruised the paved path, the animals' areas lit strategically for good views. We convinced Anica to take the optionlal walking trails at the halfway point. She was very brave, as these are often very dark. She even agreed to go into the free-range bat enclosure. I promised her I'd brag on her behalf. 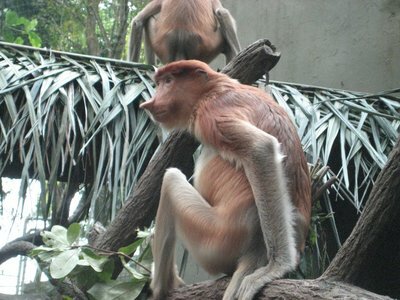 She stood and looked at a huge flying fox right in front of her. Later, back on the tram, a tapir stood so close I could've reached out and touched it. No photos of this night, but I doubt we'll ever forget it. We got to Vancouver's airport around noon Saturday and didn't get to our hostel here in Singapore until after midnight Sunday night. In between was 19 hrs. of flying and crossing the international dateline. I kept getting confused! By the time we arrived I had no idea what day or time it was back in Canada. SIA was, however, about the greatest economy class flight we could have had. Constant food and attention, and a great (free) on-demand menu of movies, TV, music, games. We watched 2 or 3 movies each. I've always wanted a day to just do that! The real hassle was getting off the plane in Seoul for the hour stopover. Sure we wanted to stretch our legs, but who wanted to get back on? Not Anica, but she was a trooper, and also got more sleep than us (even slept through landing)! After sleeping on the plane, it was hard (well, for me) to sleep through to the morning in Singapore. Our hostel is bare bones, but charming, and is in Chinatown. The AC needs coaxing, and the "shower" is a drain between the sink and toilet. I held the shower head this morning and called out: "I feel like I'm deliberately flooding the bathroom!" 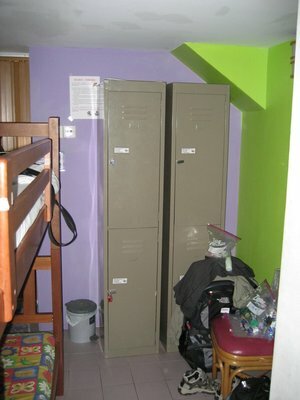 Here is the other end of our hostel room, including the lockers. We enjoyed the typical Malaysian toast for breakfast: a sugary, buttery, coconut and egg spread called "kaya." This spot 2 doors down will probably do for every morning. We had in mind an easy first day orienting ourselves (no pun intended), but that ended up still involving a lot of walking in humid heat. We did the hop on/off bus our SIA boarding passes gave us and checked out the Orchard Road shopping district. Imagine Broadway or Oxford Street but with huge, tropical trees left untouched. Lunch was surprisingly fresh and authentic at a mall's food court. We ordered a custom plate of fresh cut fruit to share for dessert. After lunch, Anica encounters her first squat-style toilet. 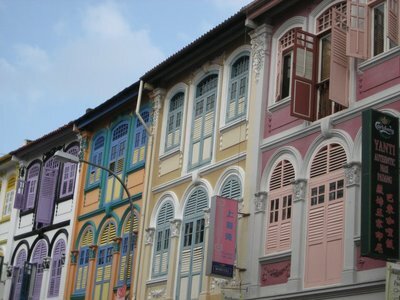 In Singapore, however, there's almost always a choice of styles. 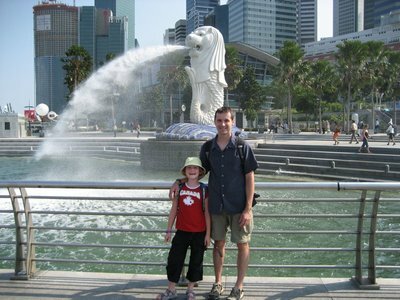 Another hop off was to see the "Merlion," the famous half fish/half lion fountain/sculpture and symbol of Singapore. Dinner was at a sit-down, Western-style restaurant back in Chinatown. The walk back was spectacular: the Chinese night market was lit up with lanterns; also a huge Hindu temple, and an enormous Chinese pagoda all looked great at night. Survived 19 hour trip to Singapore. Singapore Airlines was fantastic. Anica was great. She felt sick on the plane and wanted to go home but overcame that and after a few hours sleep on the plane was feeling better. Very up and down. One minute /loves/ everything, next minute tired and cranky, etc. Real trooper though. Had to get off plane in Seoul which was weird. Lost bottles of water. Hotel good. Very... basic. Has A/C and own bathroom but taking shower soaks whole bathroom. Felt much better about room half way through night and infinitely better by morning. 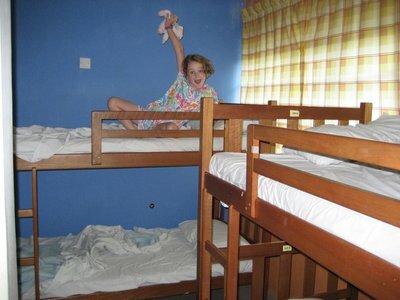 Anica loves bunk beds. Taxi drive here great. Gorgeous trees and flowers even at night. Very warm. 28 when we got here. Owner met us at door. Very nice lady.